Brooke (my third grader): Emma played with Lily and me at recess today. Kayla (my fifth grader who likes to correct her younger sister): Lily and I. Me: No, Kayla. She was actually right. "Lily and me" is the correct way to word that particular sentence. Kayla: No, it isn't. My teacher always corrects us when we say it that way. It's always supposed to be "Lily and I". Actually, I can relate to Kayla's overgeneralization of the rule. When I was younger, I always thought that "(Name) and I" was the rule that should be applied to every sentence, too. I specifically remember the exact high school English class where I learned that me should be used instead of I when the pronoun is the object of the verb. For example, in Brooke's sentence above, "Lily and me" are the objects of played. I is a subject pronoun, while me is an object pronoun. Therefore, in this sentence, "Lily and me" is correct. This is a common grammar error among many upper elementary students. Frankly, I even know many adults who make the same mistake when speaking or writing. Therefore, the conversation inspired me to create this short "I versus Me PowerPoint"! This PowerPoint is FREE in my store, so go ahead and download it if it's a minilesson that might benefit your students. 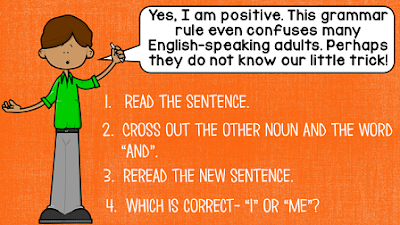 I start with some basic sentence slides where students fill in the blank with "I" or "me". After the brief review, I introduce the structure "(Name) and ____". It also includes a PowerPoint companion handout where students can record their answers on the handout as you progress through the PowerPoint. Most of the amazing clip art shown above is by A Sketchy Guy. The clip art on the green slide is by Educlips. I hope you like the PowerPoint and it's beneficial for your students. Thanks so much for sharing the power point. It's great! !